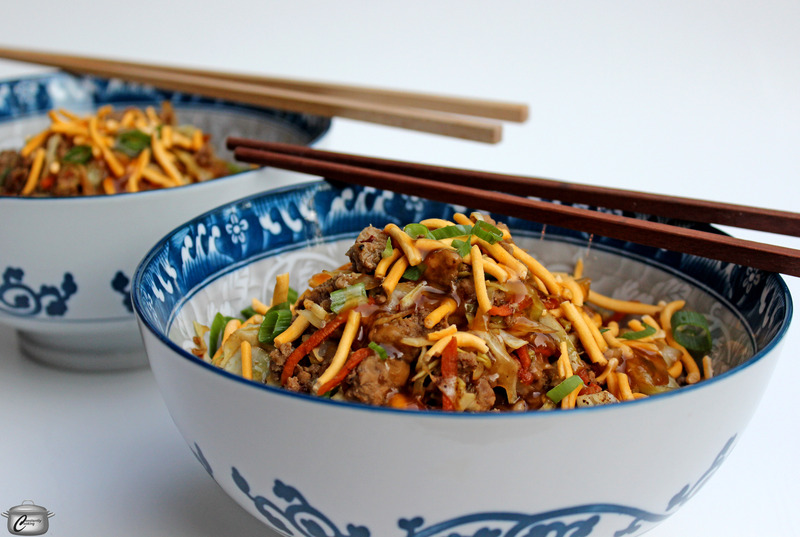 A North American Chinese food favourite gets a delicious makeover! Are you on board with the current ‘everything in a bowl’ craze? I sure am. 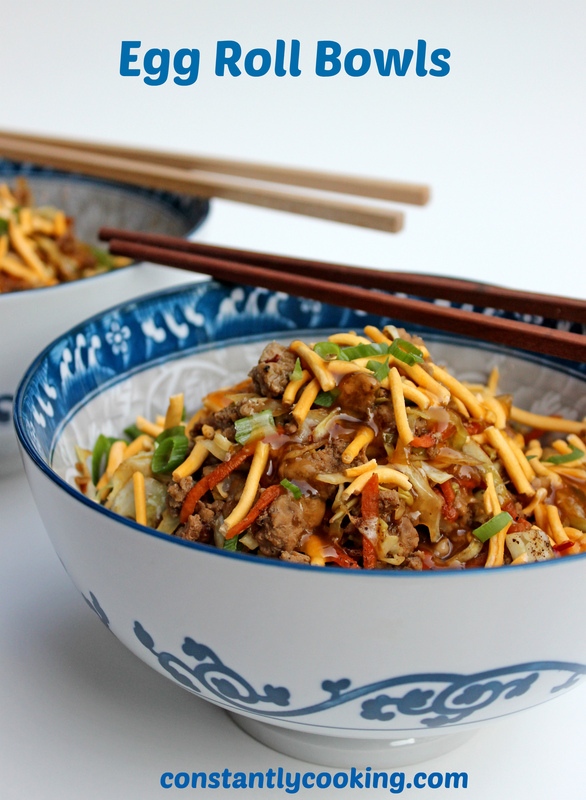 I love the idea of taking familiar dishes and recreating them in bowl format. A few of my favourites include tuna poke bowls, sushi bowls, Indonesian beef bowls and sweet & sour vegetable bowls. This particular recipe is inspired by the egg rolls my mom and I used to make when I was very young. I have no idea where she got the recipe which was definitely not mainstream ‘home cooking’ in Canada in the 1970s, but I’ve always loved this classic ‘take out style’ egg roll filling. I had a hunch it would work really well in bowl format….and I was right. A great thing about this dish (aside from the spectacular flavour) are that you can cook the pork and seasonings up to 48 hours ahead and refrigerate, then reheat in a pan and add the cabbage, carrots and sauce for a meal that’s ready in just 5 minutes. The leftovers also reheat fabulously well, making for a delicious, portable lunch option. I made this with ground pork but it would be equally delicious with ground turkey, chicken or even textured vegetable protein for a vegan version. In a medium bowl, combine ground pork, 1 tablespoon (15 mL) soya sauce and cornstarch. Stir to blend well (or mix with your hands) and set aside for 10 minutes. Heat sesame oil and canola or olive oil in a very large skillet over medium high heat. Add seasoned pork and cook, stirring often, until no longer pink, about 6 – 8 minutes. Add the garlic, cooking onion, white portion of the green onions and fresh ginger. Sauté until the onions are translucent and the garlic and ginger are fragrant, about 2 minutes. Add ground ginger and allspice plus black pepper and Sambal Oelek or Sriracha. Sauté until the pork is cooked through, about 3 more minutes. When pork is cooked, add the cabbage and carrot to the pan, along with the soy sauce, rice vinegar and sugar. Sauté for 2 – 3 minutes, stirring often, until vegetables are tender. Put hot cooked rice in individual serving bowls and top with pork mixture. Sprinkle with reserved green onions and sesame seeds or crushed chow mein noodles. Serve warm, with plum sauce on the side for drizzling. This entry was posted in bowl, dinner and tagged Chinese food, deconstructed egg rolls, delicious, dinner, egg roll filling, egg rolls, gluten-free, lunch, make Chinese food at home, North American Chinese food, Paula Roy, stir-fry, vegan, vegetarian. Bookmark the permalink. Another hit! It is so healthy with all the veggies I don’t feel guilty having a second helping. I added salt when serving, as I used coconut sauce for the soy sauce – it is gluten free, vegan, and has 90% less sodium than soy sauce. I’m looking forward to tomorrow’s leftovers! Thanks, Paula!